It’s a sunny Saturday morning in Kalobeyei, Northern Kenya, close to the border with South Sudan. Two girls walk slowly towards a field where children are playing under the scorching sun. One is of Somali origin and the other from South Sudan. For them, Kalobeyei, one of the villages in the UN Refugee Agency's Kakuma Refugee Camp, has become their new home. Their faces illuminate a sense of peace, and in their eyes we can see hope. One can only wonder how much change these two girls, united by fate, have experienced in their young lives. 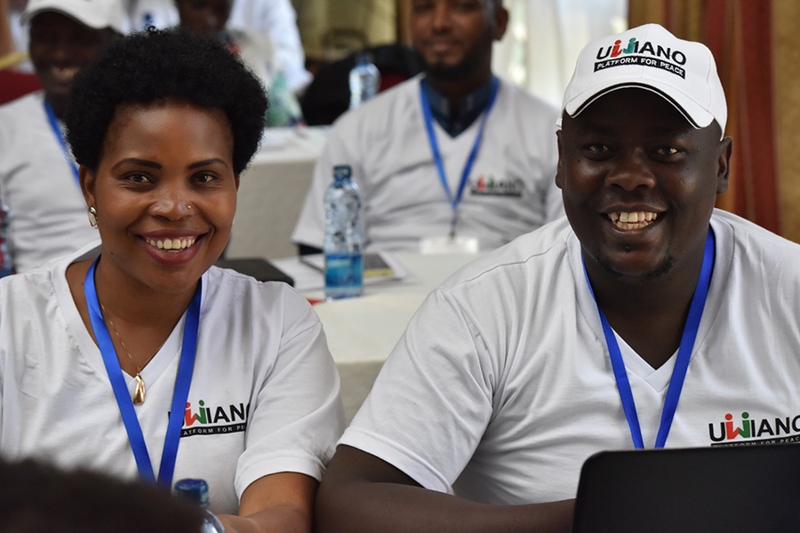 Castro Barasa (right), one of the 12 UN Volunteer Peace Coordinators, during the Kenya Government induction training with one of the 200 government-recruited peace monitors. The case of these two doesn’t stand in isolation. According to the UN Refugee Agency (UNHCR), 31 people are displaced every minute across the globe. Sub-Saharan Africa alone hosts more than 26 per cent of the world’s refugee population, with over 18 million people in this region being people of concern, mainly due to ongoing conflicts across the region. Kakuma refugee camp for instance, has grown from a population of 8,000 in the 1990s to about 185,449 registered refugees and asylum-seekers by end January 2018. The camp plays host to unaccompanied minors who have fled war from the neighbouring countries of Sudan, Somalia and Ethiopia. Protracted political strife arising from local and national grievances and inter-communal conflicts and large-scale human rights violations continue to make the East and Horn of Africa one of the most unstable and complex sub-regions in the world. In 2017, the sub-region hosted some 3.2 million refugees, mainly from the Democratic Republic of the Congo, Somalia and South Sudan, and nearly 5.76 million internally displaced people resided in Somalia, South Sudan and Sudan at the end of October 2017, according to the UN Office for the Coordination of Humanitarian Affairs (OCHA). These conflicts have been fueled by longstanding disputes over limited resources, historical injustice, political and cultural differences, corruption and organized crime, to name just a few. In South Sudan and Somalia, conflicts are heavily linked to inter-clan tensions. Conflicts often start at local and national levels, but then go beyond national boundaries, with thousands of refugees crossing borders every day. This has serious implications for development. Inclusive social development is a core dimension of sustainable development. Through active volunteerism, social inclusion can be promoted in line with the transformative ideology of ‘leaving no-one behind’. With its universality and value base, volunteerism opens powerful pathways through which people can counter exclusion. For one, volunteerism enables ordinary people to engage with those in power on issues that affect their lives. It is rooted in the principle that there is a wealth of knowledge and experience within any community which can be channeled into collective action to achieve the community's desired goals. The United Nations Volunteers (UNV) programme leverages the concept of volunteerism to promote peace and development. In the East and Southern Africa region, UNV works in 22 countries, where it has mobilized more than 2,000 international, national and community volunteers to empower community members and advance peace initiatives and sustainable development in the past year. For the people of Kalobeyei Settlement scheme, a new dawn beckons. In partnership with UNHCR and the Lutheran World Federation, UNV is strengthening refugee community resilience and supporting peaceful, sustainable co-existence. More than 22,000 refugees have been reached in the first year of the project, with 125 refugees already recruited as volunteers. Eleven volunteer teachers delivered an effective curriculum at Kalobeyi Settlement Primary School, which hosts 4,448 children and youth. The newly established volunteerism centres are innovation incubation hubs, and are already hosting youth football tournaments. By supporting sports, education, innovation and entrepreneurship, UNV is keen to change the lives of refugees and help them gain access to better opportunities ahead. Going forward, there is a need for increased acknowledgment and appreciation of volunteerism as a form of social capital, with reference to the role of volunteering in promoting social inclusion, civic participation and community development. Through increased mobilization and support to volunteers, particularly youth, countries in sub-Saharan Africa can significantly reduce the degree of conflicts in the region.